That is quite the capture. 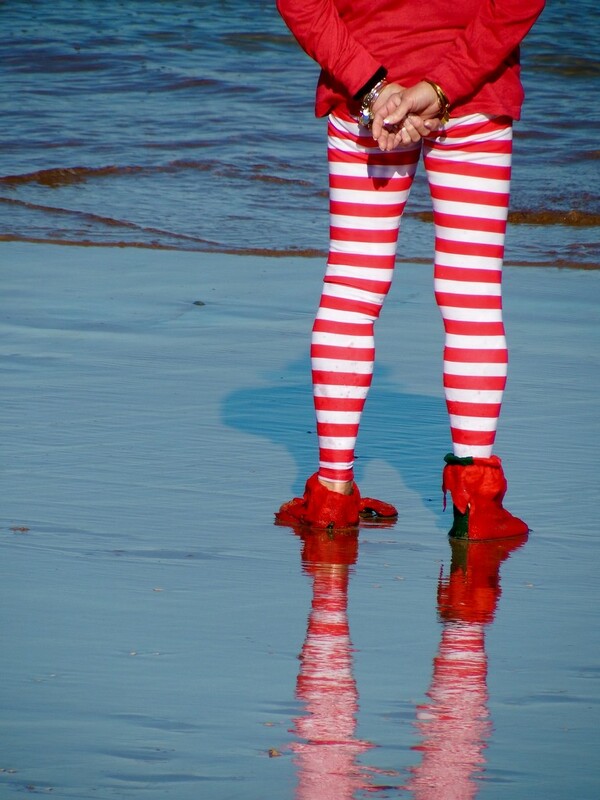 Santa's elf, chilling at the beach! :) So well spotted. This is mesmerizing. LOL What a great find and capture. Fav! Ha, ha!! Those stripes are so eye catching, love the reflection. Consider tagging this for the theme isolated. ...and was there a red hat too??? Oh what a fabulous find! Someone who is obviously shy and retireing! Lol! Wonderful shot with lovely reflections! Fav! I'd be worried about the boots getting wet. Fabulous bold colours and reflections! Fav. Ok wow. just fav for everything! Wow! That is one-of-a-kind for sure! So lucky you were there to immortalize! Love it but I bet she had wet feet! I'm trying to work out what she has on her feet. So fun! I love the colours. Great shot. What a super, colourful shot. Love it. Fav. Awesome! Love the colors, reflections. Fav. Cool and bright, love the stripes! Great reflection, it makes ithem look like one huge set of long legs. Lovey bright colours, it's rainy and dull here today. Fantastic. Love the brilliant red and reflections. This made me smile instantly! Now there's a sight you don't see every day! Hey, you're on the Popular page! Really? Someone actually goes out in public like this? Pretty funny! Congrats on the PP! @nanderson just what I was thinking! Great shot! Reminds me of Elf! Great find! Love the color and reflection - creates great interest, makes one wonder. Not your typical beach attire...but then I live in Southern California, and *the dudes* here are so predictable! I missed this one when it came out. Very funny. Congratulation on making top 20! Congrats on TT -- great timing for this composition!